When my fabulous, gorgeous, talented, youthful, vibrant, funny, caring and all-around wonderful sister, Cathy, invited me to Christmas breakfast, I knew I wanted to bring something delicious and special enough for the holiday. Lately I've had egg nog on my mind, so I figured I'd do a French toast casserole. Who knew I'd find so many variations!! And then I found this one on a blog called Real Housemoms. Perfect! It's exactly what I wanted. It's basically just like any other French toast casserole, but it uses egg nog instead of cream. Simply brilliant! It doesn't even need syrup because it's already sweet and fabulous as it is. And the fact that you can do it ahead is a total time saver! Anytime you can do something ahead, do it! So, thank you, Aubrey from Real Housemoms, for the fabulous recipe! 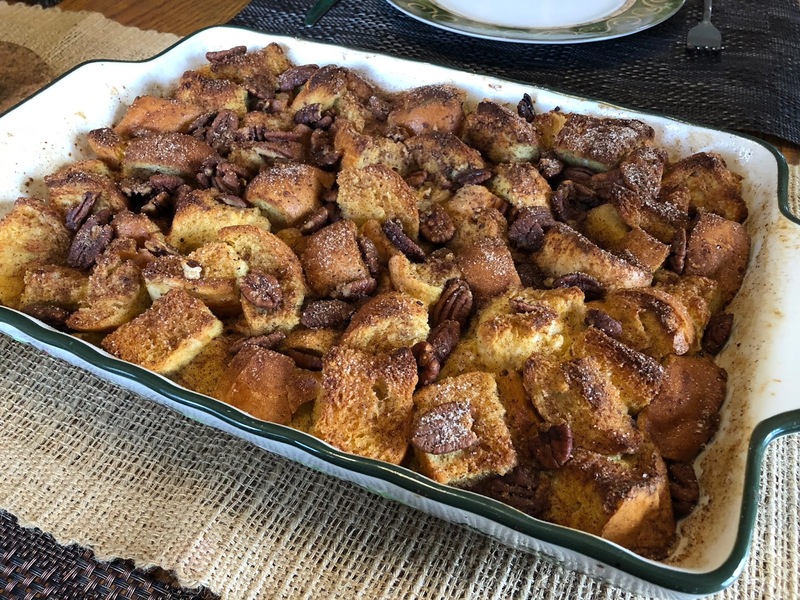 I think this just may be my new go-to French toast casserole recipe!! In a large bowl combine eggs, egg nog, sugar, nutmeg, cinnamon, salt, and vanilla. Toss in bread cubes and cover completely. Place in a greased baking dish evenly and pour any remaining egg nog mixture. Cover the dish and place in the fridge overnight or eight hours (see tips!). Mix brown sugar and 1/2 teaspoon cinnamon in a small bowl. Uncover French toast and sprinkle an even layer of cinnamon brown sugar on top. Preheat the oven to 350 degrees. Bake for 45 minutes uncovered. I added chopped pecans. Why? because I like 'em! Feel free to add raisins, craisins, or any other add-ins you like! Btw, I've seen other recipes that use frozen waffles instead of French bread. I'll definitely have to try that next time!